Swimming for kids is about having fun and boosting their confidence in the water. Owning a swimming pool might lead to the fun filled experience with your kids, however, it will take a tragic turn if you are not familiar with the safety protocols around the pool. Therefore, we have put together a list of some useful tips to make your swimming pool safer for kids. Better be prepared sooner than regret later. If you want to make your swimming pool safer for your kids, the first and foremost thing to do is to teach them how to swim. Knowing how to swim makes the swimming pool safer for kids like none others in the list could, as the one who doesn’t know swimming is more likely to be a subject of various accidents in pool than the one who knows swimming. Teach them how to swim, use life jackets or tube at the beginning until become familiar with the water. You can also take them to the professionals to teach them swimming. However, the first one might be preferable because it will mean quality time with your kids. 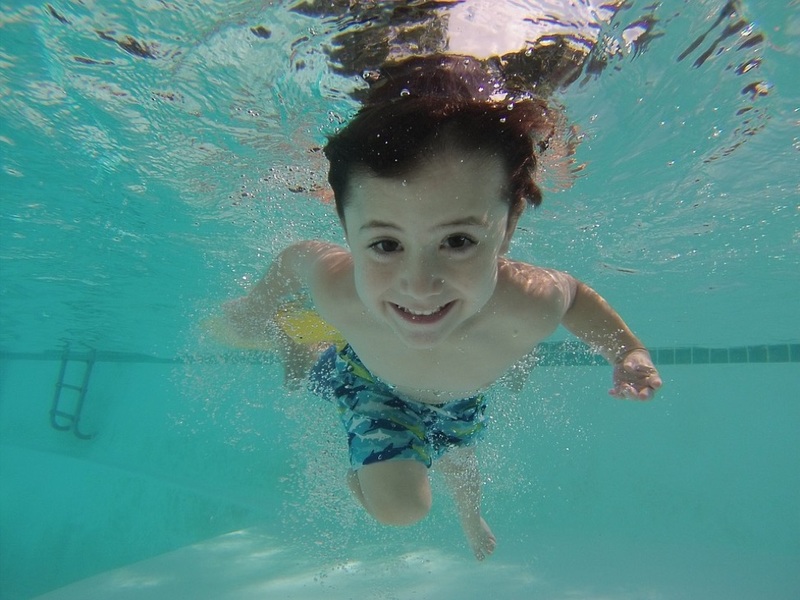 A kid may know swimming to the heart but under unfavorable conditions, he is more likely to wilt and panic, which might be hazardous to their safety. Knowing about swimming is the first step for safety, but it is not the last. Therefore, constantly supervise your kids when they are around the pool, it’s the best way to ensure their safety. God forbid accidents occur but if something unfortunate does happen, you will be there to act swiftly before the situation can worsen. You might want to learn how to perform CPR, it comes very handy. You should know when the situation is under your control and when it is the time to call for help at 911. After all, it could be a matter of life and death. When your pool is not in use, it would be prudent to use the safety net and also secure your pool with pool cover. This is vital because if your child trips and falls, it will prevent them from ending up under the water and the grave catastrophe could be avoided. However, your cover should not be partially on the pool, when it is in use because your younger fledglings might get caught under it. Invest your money in safety covers, don’t be a miser because at the end of the day it’s about the safety of your children. This is another effective way to secure your swimming pool against any mishaps. Aluminum fences are popular among the swimming pool owners for the ease of installation. Erect the aluminum fence around your pool and install the aluminum gate as well, if your pool is an in-ground pool. If you have above-ground pool, remove the steps when not in use. This will obstruct the children from getting near it. About the fence, an aluminum fence should be at least four feet high and must contain vertical fence picket separated by enough distance, so that children can’t use them as ladder. Finally, the gate should be self-closing, self-latching, and child resistant. The best way to ensure the safety of your kids is to give them no reason to go near the swimming pool, when you’re not around. Hence, you should keep the temptations such as toys, furniture away from the pool. Yes, you might like sitting beside the pool on a chaise lounge, read the book or enjoy the night with a glass of red wine but we suggest you to remove the chairs and tables after use. Remember, if they have no reason to be around the pool, there is no reason for a catastrophe. Before you begin, you have to know about four types of alarms that can be used in the pool. First, perimeter alarm gives a warning, if someone breaches the perimeter around swimming pool without your blessing. Second, pressure sensitive alarm recognizes the ripple of water and sounds alarm. Third, gate alarm works when someone opens it and the last, wearable alarms sound warning tone, if your kid is submerged under the water. Now that you are aware of the function of all the available alarms out there in the market, we don’t think it’s necessary to stress any further the importance of alarm for the safety of your young ones. Besides pool alarms, there are many pool safety equipment in the market which can be used to upgrade the safety in your swimming pool. There is the ‘life saver’ with a rope for the parents who don’t know how to swim. You can toss the life saver to your drowning kids to get a hold of it. Shepard hook, a long pole shaped in hook can be used to extend it towards, wrap hook around the struggling kids and possibly prevent any thing unfortunate. They come with a cheap price, so it’s better to have them handy. Below are some additional tips to further make your swimming pool child friendly. – Cover poolside with no slipping surface. – Keep the pool chemical far from the children. What is procrastination and how to avoid it?